Living organisms consist of millions, billions or trillions of cells. 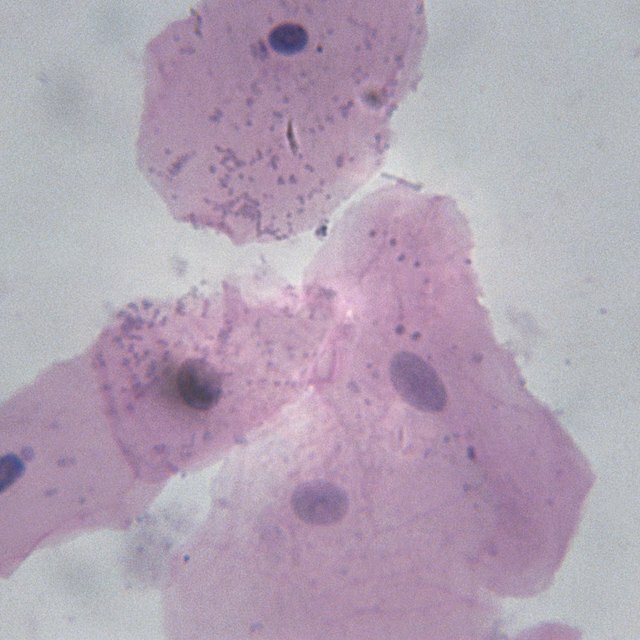 Human bodies have upward of 37 trillion, most of which can only be seen under a microscope. Other organisms, however, have only one cell in their entire body, and humans can see some of these single-cell organisms with the naked eye. Human egg cells, unusually large bacteria, some amoebas and squid nerve cells make up this list. Some people may think the eggs of egg-laying species are single cells, but that is a false classification. In general, the smallest objects the human eye can see without the aid of technology are no smaller than 0.1 millimeters. The human eye cannot see most cells without the aid of a microscope. However, some large amoebas and bacteria, and some cells within complex multicellular organisms like humans and squid, can be viewed without aids. Amoebas are single-celled members of the protozoan taxonomic group that occupy almost every body of water on Earth. In some cases, they can cause diseases in humans and other animals. Despite being just one cell, some exceptionally large members of this broad category exist. Scientists, while scouting some of the deepest places of the ocean, found giant amoeba relatives called xenophyophores, which – at 4 inches long – stand as one of the largest single-celled organisms in the world. The average size of an amoeba is 700 micrometers or 0.7 millimeters, so other members, though not all, can also be seen by the human eye. Bacteria go about their lives as only one cell. Humans cannot see most of them without the aid of a microscope – in some cases, even without an electron microscope. The smallest bacteria have a width of 0.2 micrometers or 0.0002 millimeters. However, some have much, much larger bodies. Thiomargarita namibiensis, for example, has a diameter of 750 µm, large enough for humans to see. Some bacteria can cause diseases in humans, while humans need other bacteria to live. There can be upward of 10,000 species of bacteria living in a human's body. The brain signals muscles along with every other bodily function by sending electrical impulses through neurons. While some of these specialized cells have lengths measured in meters, their diameters tend to be minuscule. While the exact diameter varies, some grow as large as 0.1 millimeter in width, just barely large enough for humans to see unaided. Some species of squid also have exceptionally large neurons among animals. These neurons have a width of one millimeter. One of the largest single cells in the human body, egg cells, have a width of 0.1 millimeter. While other creatures lay eggs outside their bodies, many millions of cells compose them, rather than just one as is the case with a human egg. Johnson, Doug. "What Cells Can Be Seen by the Human Eye?" Sciencing, https://sciencing.com/cells-can-seen-human-eye-6625247.html. 12 June 2018.